The version's date can be entered here. If you create a new version, the current date is entered automatically. The corresponding Intrexx version can be selected here. You'll find all Intrexx version numbers in the list. If you create a new version, the Intrexx version currently installed is entered automatically. 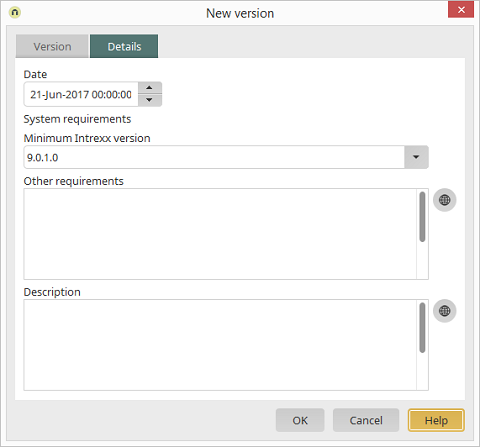 In this field, enter requirements such as database, applications, Connectors or recommended apps (e.g. Intrexx Share for plugins). Opens a dialog where the requirements can be entered in the different portal languages. A "changelog" can be written here. Enter the new or modified functions of this version here.